I recall years ago when George Washington’s and Abraham Lincoln’s Birthdays were observed separately, February 22nd and February 12th respectively. Now they have been combined on one day wherein both of these U.S. presidents’ birthdays are celebrated. 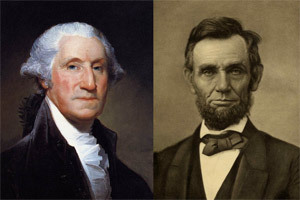 As I reflect upon the histories of these two great leaders, I often think about the adversities Washington faced amidst the American Revolution as well as those Lincoln faced during the Civil War. I am grateful for my ancestors who followed their leadership and sacrificed to provide the freedoms I enjoy today with my family. Do you have ancestors who were in some way a part of the American Revolution or the Civil War? Perhaps our own ancestors went by different names and maybe they were founding fathers in another land. Perhaps in our hearts we hold as much respect and love for our founding fathers and mothers as we do any of our own ancestors, perhaps not so well known. They were likely people who had little or no claim to fame, but performed the mundane and essential tasks it took to take care of their family and provide freedom to your nation. Regardless of the name, circumstances, or places let us hear your stories.